FREE Amazing Lesson Plan Template Printables! I had the greatest time creating this free printable lesson plan template set for all the teachers out there. Yes, dearest educators, today’s blog post is especially for you! 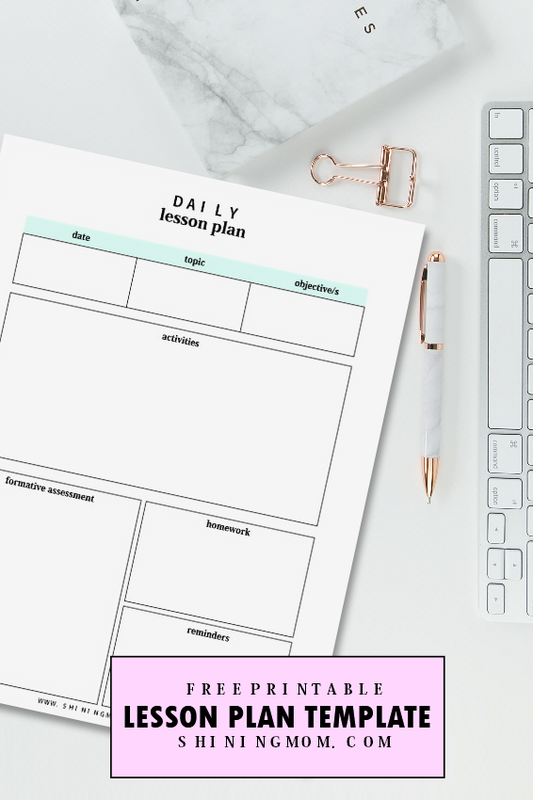 By this time of the year, I know that you are already starting to scout for some blank lesson plan templates that you can use to organize your plans for the next school year. I also know how passionate you are with every lesson you teach in class. I can even feel your love for the kids and your excitement for the new school year! If you’re following the Shining Mom blog, you surely know by now that I was a teacher for eight years before I jumped in to the blogging word. Yes, I know how it feels being a teacher. I understand that the job is not easy but it’s something very rewarding. Teacher, not everyone can touch lives with the magnitude entrusted to you. You are lucky and blessed to be a blessing to others! And because my being a teacher just roars out sometimes, I have already shared hundreds of printable planners for teachers and students here on the blog. When I miss the classroom, I create something useful for the kids and educators. It makes my heart so fulfilled that way. With the free school organizers that I share, I believe I am also still able to touch lives in my own little way, just like back when I was still a teacher. 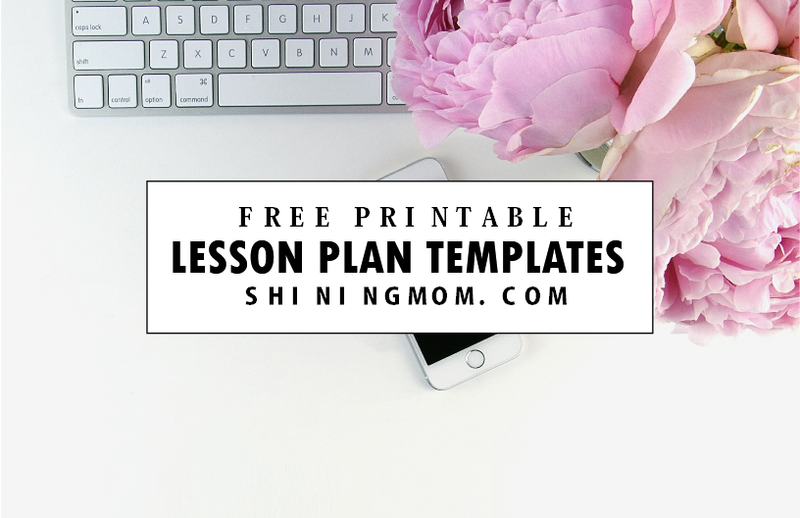 And so today, let me show you the free lesson plan template printables that I have for you. There are about 10 lesson planning pages that you can use to write down you plans for the next school season. These free printable lesson plan templates come in various styles and formats because I understand the different requirements of institutions you are into. There are even blank forms so you can write your own categories based on your own needs. I am excited to show you the pages! And oh, for more teaching organizers, I also highly recommend that you view my awesome Teacher Binder because it’s packed with teacher essentials that are all free to print! The whole binder has about 25 sheets of organizing sheets that you can print outright! I think you would like to see your lesson plan template design so I am giving you a sneak peek to the pages. Just like the daily lesson planner below, the pages come oh-so-clean, organized, practical and useful! For example, the Daily Lesson Plan page is formatted where you can write the date of the lesson, topic, objectives, assessment and homework. I have also allotted a box for you to write your other reminders! It’s simple yet functional! And because it’s by Shining Mom blog, you know that the planning pages come classy and of course, pretty! Have a look! Really, these are wonderful planning pages to help you get organized for the upcoming school year and I hope that you can use them! 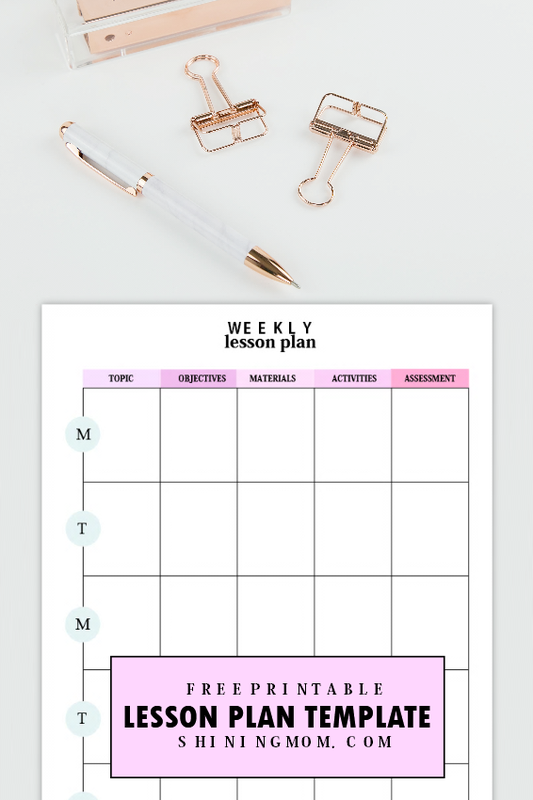 I really think that the free lesson plan template printables included here will help you hit the next school year more prepared! Should you like to use them, get the freebie HERE. Print them out in 8.5″ x 11″ paper! Meanwhile, you might like to view the other school organizers available on the blog. Grab the student binder and the back-to-school organizers I have for you! I believe they will help you hit the next school year organized and prepared! And oh, if you’re a momma, you might also like to see the ultimate household binder that I have for you with over 70 sheets of planning goodness to help you run your home blissfully! One last thing, please share the freebie by pinning the topmost image on Pinterest. That way, you’ll help me grow the blog and you can also always get back to this post if you don’t have the time to print the planners yet! You may also sign up for Shining Mom newsletter so you’ll never miss a freebie again! Have a great school year ahead, teachers! « Calendar 2018 Printable: 12 Free Monthly Designs to Love! Thank you so much for all these wonderful freebies. This would definitely help me organized in all the areas of my life. You’re welcome, dear! Please enjoy the planner!